Gaillardia, or Indian blanket flower, is an ornamental flowering plant valued for its ability to attract butterflies to the garden. Although the plant is an annual, it sometimes behaves like a short-lived perennial by reseeding and coming back a second year. Native to North America, gaillardia is hardy in USDA zones 5 through 10 and thrives in most regions of the United States with only minimal care. Flowering occurs during summer and fall, and blooms appear in shades of red, orange, purple and yellow, depending on variety. The plant tolerates heat and frost, making it ideal for northern or southern gardens. 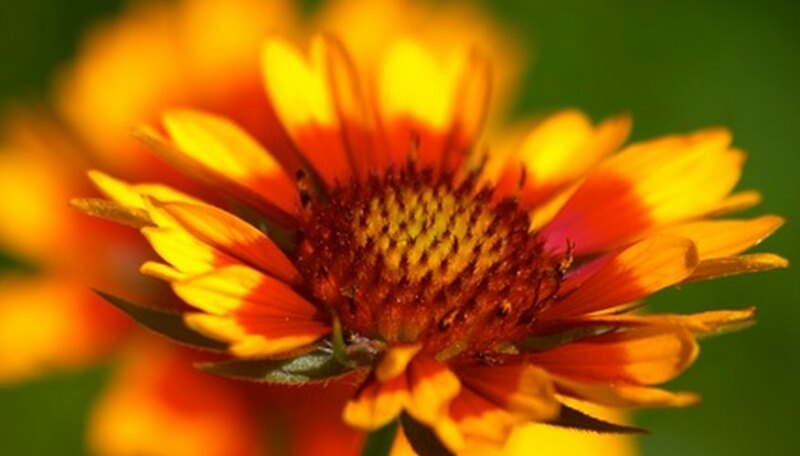 Plant gaillardia during the spring in a location that receives at least six to eight hours of full sunlight each day and contains well-drained soil, necessary to prevent root rot in these plants. Space gaillardia flowers 15 to 18 inches apart. You can also sow gaillardia seeds directly on top of prepared soil, leaving them uncovered, after the last frost. Water plants once every 10 to 14 days, allowing the soil to dry out between applications. Do not water during winter, when the plant is not growing as actively. Increase watering frequency to once every week during periods of extreme heat or drought. Feed Indian blanket flower once every other month using a balanced 10-10-10 NPK fertilizer to provide proper nutrition for flowering and root formation. Water immediately after applying fertilizer to release the nutrients into the soil and prevent root burn. Remove faded gaillardia flowers whenever possible to prolong the flowering season and encourage the growth of new blossoms. Pinch off the flowers as close to the stem as possible to minimize damage and increase the plant's visual appeal. Gaillardia does not require fertile soil, though it may increase growth rate. Flower cuttings taken from gaillardia are frequently used in bouquets and arrangements. They will last for about a week in a vase of water.